DESCRIPTION: This book carries a foreword by the Late Airey Neave MP who was murdered by an IRA bomber. Appropriately, the same publisher has reprinted, in a new format, the book by Airey Neave that was originally published in the early 1950s. The two men served together after escaping German prisons, having been captured during the closing stages of the Battle of France. Together they combined their experiences to help evaders and escapers to exfiltrate from Occupied Europe as members of MI9. Langley was head MI9. The two books complement each other and expand the combined story. Neave was wounded at Calais and ended up in the ‘escape proof’ Colditz Castle, where he was to make the first successful ‘home run’ escaping via Switzerland. Langley lost an arm at Dunkirk, was captured, but eventually made his escape via Lille, Paris, Marseilles, Spain and Gibraltar. 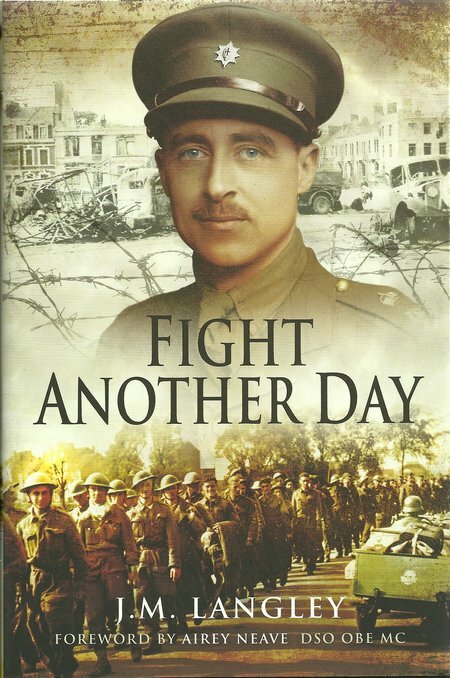 Langley had an extraordinary life in Vichy France before the Germans controlled it and his book describes the fierce fighting outside Dunkirk as the rear guard held up the German advance to enable hundreds of thousands of British and French troops to escape from the beaches of Dunkirk in the armada of small vessels quickly pulled together and sent across from Britain. The author tells a story of richly defined characters, his fellow escapees and the French underground who sheltered them and helped them make a complete escape to return to Britain. At this stage, western France was occupied by the Germans but the remainder of France was administered from Vichy by the French under German supervision and influence. The French underground was still in its early days and many of those helping POWs and downed airmen to escape were ordinary French citizens taking huge risks to do what they could to shelter escapees and pass them down a line of similarly brave French individuals. Even in Vichy France, helping escapees was not risk free because there were many French supporters of the Germans and the Vichy Government who would and did betray escapees and their fellow French citizens. When Langley eventually returned to Britain, he was recruited into the Secret Service where he ran MI9. This organization was primarily tasked with exfiltration of POWs and those who were evading capture in Occupied Europe. Some soldiers remained at large some time after the final evacuations from Dunkirk. Aircrew were lost during the expanding bombing campaign and the fighter sweeps across France and the Low Countries. Sailors reached shore and needed to escape home to Britain, and the increasing numbers of commando and intelligence operations against the Germans saw a mixture of soldiers, sailors, airmen and intelligence agents attempting to escape capture by the Germans. The result was that MI9 managed and assisted the increasingly professional Belgian and French escape lines, bringing escapees out, mainly through Switzerland and Spain, but also collecting some from the beaches at night or by flying army cooperation STOL aircraft at night from French fields. The courage of those manning the escape lines was outstanding and they helped to bring out more than 3,000 escapers. This was in the face of increased German counter intelligence operations, betrayal by Nazi sympathisers, collaborators and traitors. In the process, valuable intelligence was also obtained and sent out with the escapees. Sadly, the covers built up by the operators of the escape lines was so good that some were mistakenly abused by their countrymen as the Germans retreated because they were believed to have been collaborators themselves. When Neave joined Langley at MI9, they not only had to work hard and creatively to support the Belgian and French escape lines, but they also had to fight internal battles with other parts of the Secret Service for resources. From the first steps of the Secret Service in 1939, a bewildering number of private armies and intelligence departments sprang up. Some were established for a limited set of objectives but then managed to survive and attempt to expand their brief. Others were established to become major operators in specific areas of covert operations but with limited resources, frequently fought as hard against their own colleagues as they did against the Germans. This was not necessarily empire building at the expense of other vital organizations, but the inevitable lack of knowledge of what was being covertly achieved by comrades in other parts of the Secret Service. In some cases, the level of overlap and internal conflict was not known until after 1945 as some of the extraordinary stories began to emerge. The author has provided a fascinating glimpse, as an insider view, of the secret world that was an immensely important part of the forces that triumphed over German aggression. It is a very readable and involving book that will be of great interest to a wide range of readers.